Control Terminals that provide trackable cash flow, while providing easy, cashless convenience to the user. 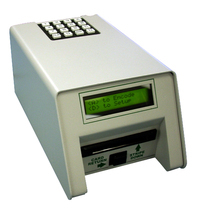 ITC Systems’ Copier Controllers provide access to a given machine through the use of an encoded reusable plastic card. These terminals are extremely versatile and can be adapted to most self serve environments and equipment that accept cash or require authorized access. Once the system is implemented, controlling and accounting for costs and cash flow is simple and accurate.